. MORE FREAKIN MILKSHAKE! Dear Five Day Weekend, you're finally here. (Insert long deep sigh). Dear Homies, before leaving the pool Mr. Loerke asks that I A) watch him do a front flip B) hold his breath underwater for 60 seconds C) perform a can opener worthy of a 10 pts or D) all of the above. Dear Love of my Life, this Saturday I've planned two secret date missions. Both require empty bellies. Get ready. What's your favorite burger place? And don't forget ... TOMORROW is the last day to make a race donation if you'd like to get your name / company logo on our kayak! Thank you so much to those of you who donated yesterday! Grindhouse in down town ATL! Best...ever and they play old horror/action movies on the tile wall with a projector! 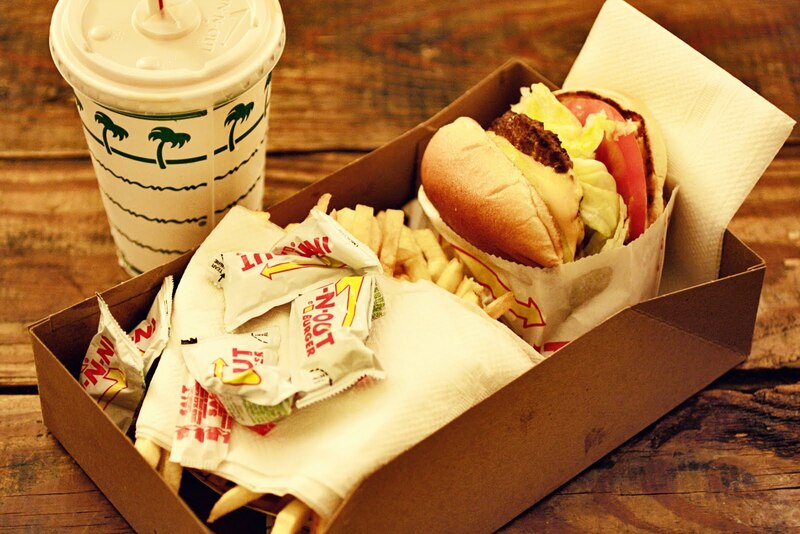 1. in-n-out rocks, and so does their secret menu. 2. more cowbell. go dawgs. I am a little obsessed with 5 Guys Burgers and Fries. I WAS really excited about 12 Burgers and Taco, but they closed down right after my first visit. The REAL treasure is MG's up in Sherman. To this day the best burger n' fries I have ever had. I've heard great things about In-N-Out Burger, but have sadly never been. I must find one to try it soon, because anything that makes you say "more cowbell" has to be awesome. Go Dawgs! Locally owned: Westport Flea Market and Blanc Burger. Chain: 5 Guys. Best of All Time For Ever and Ever, Amen: Blackened Jalapeno Burger at Tiger Town Tavern in Clemson, SC. stacy, you get bonus points for mentioning the westport flea. grew up going there all the time! also, blanc is the shiz. esp like the way they serve their fries. San Antonio - Chris Madrid's Jalapeño Chedder Cheesy. It's so good it's stupid. P. Terry's, Dirty Marin Kumbak Place, Hyde Park Bar and Grill. All in Austin, so everyone is welcome to come on down. HUGE shakes. five guys!!!! I love that they tell you where the potatoes that make your fries are from. Oh my goodness...do you watch from the window & clap or accompany him to the pool? I sure hope that you enthusiastically cheer his aquatic feats :)!!! I am dying for a good burger. Last great burger I had was from a joint in Shinjuku - 23 more days of not eating out and we will have made it a year! mmmm jealous! Josh is moving to The Colony today and I can't wait to visit (just as an excuse to eat In-n-Out of course) Our favorite is Red Mill Burger in Seattle...their secret sauce blows In-N-Out's sauce out of the water! The pool comment makes me laugh. My favorite place to get a burger is actually quite local for me. The KC Richmond's house! Your pops makes the best burgers. So yummmmay! I need his secret. Five Guys... love them for a casual date night! Obvious Dallas Choice - Twisted Root. Surprise Dallas winner - Cisco Grill's Bacon/Blue Cheese and Onion Rings. Greatest burger memories - Chris Madrid's en San Antonio. Five Guys!! So, so good. And conveniently right across from SU Campus. In 'n' Out, even though I get grilled cheese. There's something about grilled cheese with special sauce. I also always get a milkshake! here in tarrant county, we love simply burgers. MUST find out what seasoning they put on their burgers! sooo good! Ball's burgers on Northwest Hwy. our new favorite burger place is Five Guys Burgers + Fries. We just got one in Oregon about a month ago and it's in just 10 minutes away! So yummy. Boylan heights Burgers in Charlottesville, VA! They use all local and organic ingredients and you can build your own burger. You could go every day for a year and not get the same thing twice. Yummers! D! and Hodad's in SD, CA (Ocean Beach) is the bomb diggity!! go now! Welcome to the magic. It is muy delicioso.